NC Teacher Pay Breaks $50k, Cue The Complaining? Teacher pay in the state of North Carolina has continually risen for the last four years and the average has now surpassed $50,000 a year, not including benefits. Cue the complaining from “non-partisan non-profit” outrage industry. The average teacher salary has risen 12 percent over the past five years, from $45,737 a year. Since taking control of the state legislature in 2011, Republicans raised the starting base salary for new teachers to $35,000 and gave raises to other teachers. Some of the credit, as the article above notes, goes to the districts who jacked up their teacher supplement pay. What’s supplement pay you ask? Every district has the option of including additional funds to teacher pay, called a supplement. The bigger the district, the fatter the supplement usually. Wake County’s is the largest currently at $8,469. NC Dept. of Public Instruction used to publish the supplement schedules. Funnily enough, they stopped doing it around the same time former Superintendent June Atkinson started harping on teacher pay along with the outrage machines in the state. I reconstructed that discontinued DPI report annually by hand using the DPI Statistical Reports. For those who want to go look it up on their own, go to the NC Public Schools Website Data and reports, then click the link for Statistical Profile Online, then select State Summary > Public School Personnel > Chart 20. LEA Name Teacher No. of Positions Teachers Rec’d Supplmt Teacher Average Supplmt. Don’t expect perennial outrage manufacturers like the NCAE, Progress NC, and it’s pathetic teacher protest arm, Aim Higher NC, to be happy about teacher pay breaking this new milestone. These organizations are only interested in driving their democrat friendly, political partisan narratives and sowing discontent. Expect them to throw lines like ‘But…But..pay adjusted for inflation!’ or employ some bizarre explanation that proves the struggle with Common Core math is real. Shocker, Progress NC's go-to Lawyer is helping far left Flip NC. Flip NC putting AIM Higher Now's logos in their emails makes sense now. Don’t expect Democrats in the legislature to stop pouring gas on their self-created fire either, because if North Carolinians have learned anything over the last 4-5 years, it’s that enough is never enough. This entry was posted in BlueprintNC, EDUCATION, LL1885, NC Dems, Outrage Industry, POLITICS NC and tagged Aim Higher NC, NCAE, Progress NC, Teacher Pay. Bookmark the permalink. 9 Responses to NC Teacher Pay Breaks $50k, Cue The Complaining? No it’s not mathematically impossible. It’s in black and white in our pay checks. If I’ve had a supplement “roll over” into my salary, then it is playing dead. Yes. I am a teacher, That’s the problem. Faulty facts and reporting from the budget department summaries. What they need to do is ask a teacher. PS..Lottery Money does not go to education. Biggest boondoggle they’ve lied about yet. I’m sorry, but you’re not making much sense. Your longevity was rolled into your salary. Your supplement is a separate item. I assume you are in Wake County? The supplement has increased several times and the average is now nearly $7,000. I’m not going to dispute anything you said. I’ll just give you the facts that you attest to right down to the predictions on outcomes. But why does every issue have to be looked at through a partisan lens? Charter School teachers from a cursory look at the facts get paid a tad bit less than their public school outright counterparts with a less, often times not much benefits. For profit schools have mostly been scams with no to little evidentiary based outcomes in the right direction. Why not take one thing that most people are passionate about and want the same outcomes for the most parts and make it a people (kids, parents and citizens of NC) issue and turn the paradigm on it head? 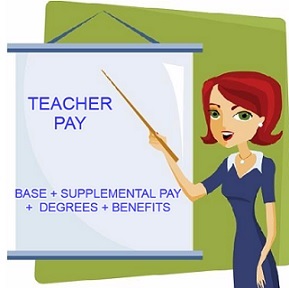 Teacher pay is critical in attracting good teachers. Yes, it’s a public not private job and on those we could perhaps debate the merits. But, partisans bicker with tribes entrenched. Heroes reach beyond the divide. Just two cents. Not criticizing you at all, I hope that comes through. To be honest, I am not sure what message you’re trying to get across. If your complaint is that everything has become partisan and it shouldn’t be, I’m with you. However, this is the world we live in right now. Everything is turned into a political football. Teacher pay is, of course, critical. NC has raised pay every year for the last 5 to 6 years, introduced multiple new bonus programs, incentive programs and has improved the starting base pay for new teachers. Yet this is not enough for the lefty “non-profits” in NC I mentioned. If they can’t complain about teacher pay, they complain about per-pupil funding. If it’s not per-pupil funding, it’s textbook money. I’ve been dealing with these partisan hacks for nearly a decade – they never applaud, praise or celebrate They are perpetual complainers because praising or applauding aids those who enacted the good measures — REPUBLICANS. I wonder why no one ever challenges the salaries at NCAE! I wish Dale Folwell’s office could compile a simple explanation of how state salaries work…most teachers just get info from NCAE and their “you’re a victim” stance. NCAE has refused to release their membership numbers over and over. Go search the Civitas site for NCAE. You’ll get an eyeful. Teachers with 25 years and up got NOTHING! Haven’t had a raise in 4 years! They also took our longevity away (just teachers mind you not state employees) so I have actually had a pay cut! Coworkers with less experience and no graduate degree like I have make more than I do! Leaving the increases from the local supplement out of the equation and ignoring the salary charts from DPI showing annual increases to 25+ teachers, base pay increases have occurred in each budget starting I believe in 2011-2012. The step increases frozen under Beverly Perdue were reinstated in the 2016 budget. Increases ranged from 2.1% to 13% with an average of 4.7%. Teachers around the 25+ mark were set for a 9.7% increase according to the conference report figure. Prior to that, if I recall, in 2014 anyone with over 7 years experience received an increase ranging from 2% to 4.3% based on certification level. Your longevity was rolled into your base pay in 2014 as part of the new salary schedule and new bonus structure. Your pay was not “cut” it was folded into your base salary, raising it and the level of bonuses you can receive. This is mathematically impossible for someone in your district unless they are very close in the number of years of experience, have the max. certification there is and are receiving bonuses under the multiple pilot and initiative programs currently operating. I am assuming you are talking about yourself because you use “our” and “I” in your comment. Can you please clarify – Are you a teacher then? Or are you a DHHS employee with the Early Learning Challenge Division?